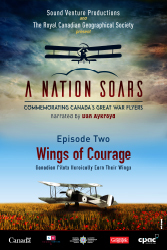 Wings of Courage is the second part of a trilogy of projects called A Nation Soars: Commemorating Canada’s Great War Flyers. To highlight Canada’s first aviation heroes, Sound Venture, Canadian Geographic, The Royal Canadian Geographical Society, CPAC and Canadian Heritage, have partnered together to create an hour-long documentary, a Vimy Ridge trench map, six educational videos and the construction of two replica First World War aircrafts. Wings of Courage, narrated in English by actor Dan Aykroyd and in French by explorer Bernard Voyer, looks back at Canada’s early aviator heroism from a personal and modern perspective. The personal perspective is colourfully captured from compelling stories provided by surviving relatives, or passionate supporters, of popular and lesser-known Canadian FWW pilots. The modern perspective is examined through biplane builders, FWW pilot enthusiasts and Air Cadets who bring the past to the present during the construction and testing of two FWW replica biplanes. The often heroic and stressful life of Canadian pilots in the air and on the ground serves as a revealing background to Wings of Courage’s featured profiles of five notable Canadian fliers. Men like Roy Brown, credited with killing the Red Baron; Andrew McKeever, the Allies’ greatest two-seater ace; Newfoundland’s Carl Falkenberg, whose family was of Swedish nobility; Joe Fall, the only holder of three Distinguished Service Crosses for aerial gallantry; and Gerald Birks of Birks Jewelry fame are profiled. Each profile is presented by either surviving relatives of the pilot, or by a passionate supporter. All bring to light little known personal and emotional insights. Interwoven with these riveting Great War flyers’ stories is the parallel story of two replica FWW Sopwith Pup builds, at the Canadian Museum of Flight in Langley B.C., by a dedicated group of biplane builders and pilot enthusiasts who, at one point, bring in Air Cadets to witness and assist in the builds themselves. During this special collaboration, the program reveals a timeless emotional connection between present day Air Cadets with their century-old peers of the First World War. Seguing from the Pup builds the documentary also looks at the rapid technological and tactical progression of aviation during the course of the First World. A period in history that ultimately led to the British Royal Flying Corps establishing flying schools in Ontario and accelerating Canada’s aviation industry. One giant (8 metres X 11 metres) and four classroom sized (5m x 4m) คาสิโนที่ดีที่สุดในโลกtravelling floor maps featuring Vimy Ridge, with accompanying teacher resources, for borrowing free-of-charge by members of Canadian Geographic Education. There’s also a bilingual tiled poster map featuring a FWW barrage map used at Vimy Ridge. In October, a suite of Canadian Geographic in the Classroom education material will be released to accompany a Wings of Courage photo essay featured in the October 2016 issue of Canadian Geographic.